Government Point is located in the South Coast region of California, within the Point Conception State Marine Reserve. This site is approximately 1.5 km downcoast from Point Conception, an important biogeographical barrier, and is near the Point Conception Mussel Watch site. Government Point is arguably one of the most important sites monitored by the MARINe group because it is located at the junction of two major biogeographic provinces (cold-temperate Oregonian and warm-temperate Californian), where the ranges of many marine species begin or end. Thus, it gives us the unique opportunity to study species that might be living at their maximum tolerance level to certain environmental stressors, such as temperature or wave exposure. Monitoring community change in the marine environment at this unique location provides important insight to understanding the impacts of global climate change. Government Point is accessed via private property, and there is almost no human visitation. This gently sloping site consists of moderately uneven terrain, containing few cracks and folds. Government Point is dominated by consolidated bedrock, and the area surrounding the site is comprised of a mixture of consolidated bedrock and sandy beach. Some unique features of the site include deep water directly offshore and numerous natural hydrocarbon seeps in the surrounding offshore benthos. Naturally occuring tar is common at this site, particularly in the high zone. The primary coastal orientation of this site is south/southwest. Long-Term Monitoring Surveys at Government Point were established in 1992, and are done by University of California Santa Cruz. Surveys were not done between 2007-2013, when ownership of the land adjacent to the site changed hands, but the site was revisited in 2014. Long-Term MARINe surveys target the following species: Chthamalus/Balanus (Acorn Barnacles), Pollicipes (Goose Barnacle), Mytilus (California Mussel), Silvetia (Golden Rockweed), Endocladia (Turfweed), Phyllospadix (Surfgrass), and Pisaster (Ochre Star). 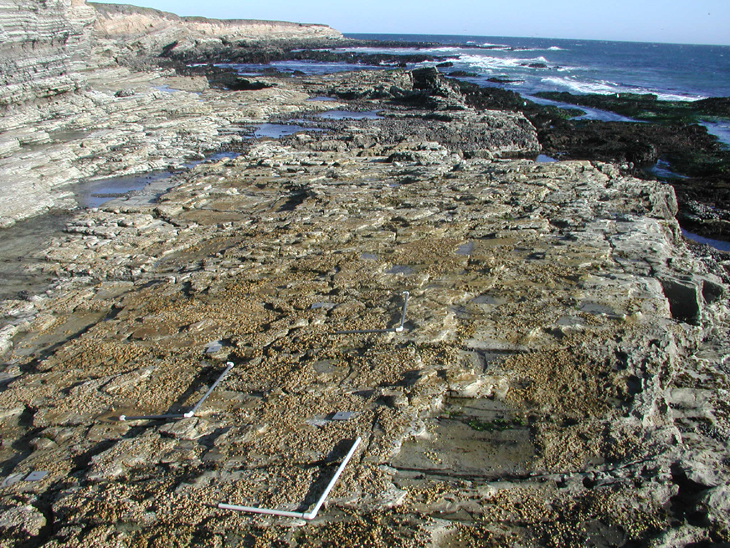 In addition, motile invertebrates, barnacle recruitment, and water temperature are monitored at this site. Click here to view Long-Term trends at this site. Biodiversity Surveys were done by University of California Santa Cruz in 2001, 2006, and 2016. The Biodiversity Survey grid encompasses two sections that are approximately 12 meters (along shore) x 25 meters (seaward), and 15 meters (along shore) x 25 meters (seaward). Click here to view Biodiversity Survey findings at this site. For more information about Government Point, please contact Pete Raimondi.